Today, after many years, we’re releasing an updated brand identity, which includes a new logo, colours, and font. You’ll see the new look anywhere we’re out in public, like our website and Facebook; very soon you’ll see it in all of our products, as well. We believe the new look better matches what we’ve become since: a modern and trusted provider of awards throughout the United Kingdom. Since our founding, we’ve more or less stuck with the same dark blue logo and whilst we tried and tested a new logo recently we were not content with the outcome. But in the last few years, we’ve changed quite a lot: we launched new specific awards for Fish & Chips, Takeaways, Gastro Pubs and our sister publication launched the Good Hotel Awards. The old look was great, but we wanted to improve this for todays world. Our dark blue logo represented both trust and integrity, however, we wanted to add a modern twist and decided on a lighter blue to match our merchandise. Plus we wanted to take this opportunity to create our unique brand identity. Needless to say, it was time for a change. Our design goal was to better match how we look to our values and the users we serve. A small team worked to find something that appeared crisp, approachable, smart, friendly, connected, modern and yet trusted. Emphasis on ‘Good Food’ was needed to make it obvious to our readers and fans as to the basis of our awards. We embarked on an ambitious project from inception and our logo creation was no different. We retained our blue background as this symbolises both professionalism and trust with our readers and fans, yet our traditional dark blue logo did not appear modern and fresh in today’s digital age. We decided to synchronise our merchandise with our digital image and increase the colour temperature to a lighter shade to somewhat reflect the modern, progressive and trusted awards programme that we have become. We loved our initial rosette included in our logo but we couldn’t help but think it looked like it could have been added by anyone! We aimed high with the redesign and whilst we desired a subtle nod to the past, we wanted a clear, dynamic, modern, trusted; yet a recognised alternative to what we had before. Our typeface is deliberately clean, crisp, modern and light and provides an initial impact to both our readers and fans alike. With prominence given to the wording GOOD FOOD so our readers and fans can immediately recognise our brand identity and purpose. 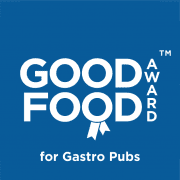 We hope you like this new look and feel for Good Food Award for Gastro Pubs! Look out for more updates—like an updated look in our merchandise and updated website as we continue to try to better serve our users with a clean, modern, user-friendly interface.